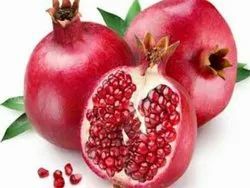 The pomegranate, botanical name Punica granatum, is a fruit-bearing deciduous shrub or small tree in the family Lythraceae that grows between 5 and 8 m (16 and 26 ft) tall. The pomegranate originated in the region of modern-day Iran, and has been cultivated since ancient times throughout the Mediterranean region and northern India. It was introduced into Spanish America in the late 16th century and California, by Spanish settlers, in 1769. Fresh Pomegranates of Indian Origin, Supervised and processed as per export standards.